Fragmentary Evidence » This Year’s Soccer Mom? This entry was posted on Wednesday, September 8th, 2010 at 10:45 pm	and is filed under Oakland, Politics. You can follow any responses to this entry through the RSS 2.0 feed. You can skip to the end and leave a response. Pinging is currently not allowed. Good eye! And welcome back. I have seen a few of these signs, but I did not give them the through look that you did. I that a zombie? And here I thought he was just going for the “crooks in government” vote, but now he wants the stalker vote, too? Speaking of crooks in government, I see that the nephew of our disgraced former city administrator has been arrested again on cocaine, gun and gang charges. What I’m wondering is this: if he ends up in prison this time, instead of on probation, then does he still get to keep his $56,000-plus-benefits job as an Oakland parking meter repairman? Is that job a lifetime sinecure, or is there some point at which repeated felony convictions and parole violations can actually get you fired? Something is rotten in the city of Oakland. A lot of Perata’s supporters probably figure that he’s the only candidate savvy and powerful enough to shake things up in city hall, and they are willing to live with his cronyism as long as he also gets stuff done. Subliminal message must be: vote for a large bulky guy who will take care of you, little one, instead of some mere woman! But if you look around at the bungalow porches of Oakland. “Gets stuff done”–but what stuff? Maybe not anything we want done! Do you know who the musicians are voting for? When did the Oakland blogosphere get so stupid? 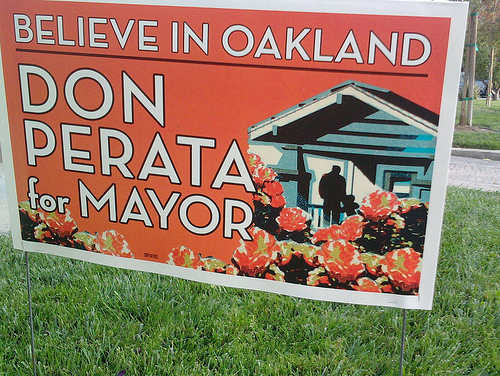 I also actually like Perata’s signs, though not the shadowy figure himself. Much better than Quan’s shoddy old signs, in which her staff(?) just pasted “Mayor” on top of “Council”. At least now she has current signs.